SIM card is a smart card in a mobile phone which plugged in and used to identify the user within the network. This makes phone connections and data connections. SIM card has a small processor with memory. Previously we wrote about USB Modem, like Mobile phones, these also uses a SIM card. SIM stands for Subscriber Identity Module. By using a variable PIN, SIM card can protect against unauthorized use. Using the SIM card the Mobile Equipment (ie usually the mobile phone) is assigned to a network and is authenticated. For these purposes are on the SIM card there are secret numbers and algorithms which are stored on ROM. These are also used to encrypt voice and signaling data. The SIM card is also used to store temporary, network-related data as well as preferred and blocked networks. In addition, telephone and short message service messages (SMS) and the memory of the last called telephone numbers can be stored on SIM card. Picture : A SIM card seen with contrast X-Ray. SIM card is often used in large ID-1 format (85.6 mm Ã— 54 mm). The smaller ID-000 -part (25 mm Ã— 15 mm) can be broken out from it. Due to the even smaller mobile devices the small ID-000 format is used. Meanwhile, there are also devices that uses even smaller micro-SIM. 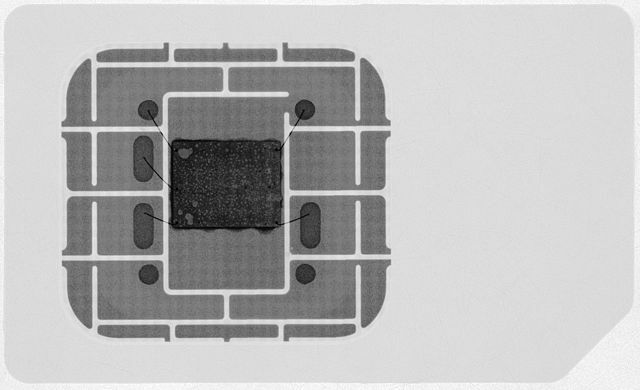 A SIM card contains eight contact surfaces. They are named as C1 to C8. There are SIM cards with an operating voltage of 1.8 volts, 3 volts and 5 volts. SIMware is the software running on a SIM card. SIM cards can not last forever. With every write to the card (eg for a authentication in the network), the process “ages” the card. Most manufacturers specify a life of 100,000 authentication. Older cards are sometimes not recognized in modern mobile phones. Current UMTS devices definitely need a map of the latest generation of its storage service features. Some SIM cards have a lifetime internal counter. The micro-SIM (3FF) Third Form Factor card is a smaller version of the SIM card. When the technical specifications of the chips are concerned, there are no significant differences with a normal SIM Card. Machine Learning is the creation of knowledge from experience that goes through learning phase. This Machine Learning is what you see in the Movies. False Appearance of Cloud by Means of Promotive Ads. Does it sound closer to Origin of Species by Means of Natural Selection? Yes, both has good and bad points. Cite this article as: Abhishek Ghosh, "SIM Card or Subscriber Identity Module," in The Customize Windows, May 2, 2012, April 25, 2019, https://thecustomizewindows.com/2012/05/sim-card-or-subscriber-identity-module/.